A few thoughts on gardening. Of the metaphorical variety. Turns out, both colleagues were right. My re-potting was a great move on many levels. Though I was originally the one who instigated our transition, I think it’s fair to say all my family members now agree that the change of scenery did us good. I can confidently say we are happily settled. So much so that Saturday night — when Mr. Mom and I hosted some newcomers for a friendly tennis match and dinner at our home — we played the roles of natives rather than transplants. The couple has only been in town 11 months. The husband travels frequently for his new job and I could tell that the move combined with frequent spousal separations meant both he and his wife were missing their east-coast hometown terribly. I told them all the things we had come to appreciate about the community and urged them to reserve judgement for two full years. The husband seemed surprised. “Two years?” he asked, unable to conceal the concern in his voice. 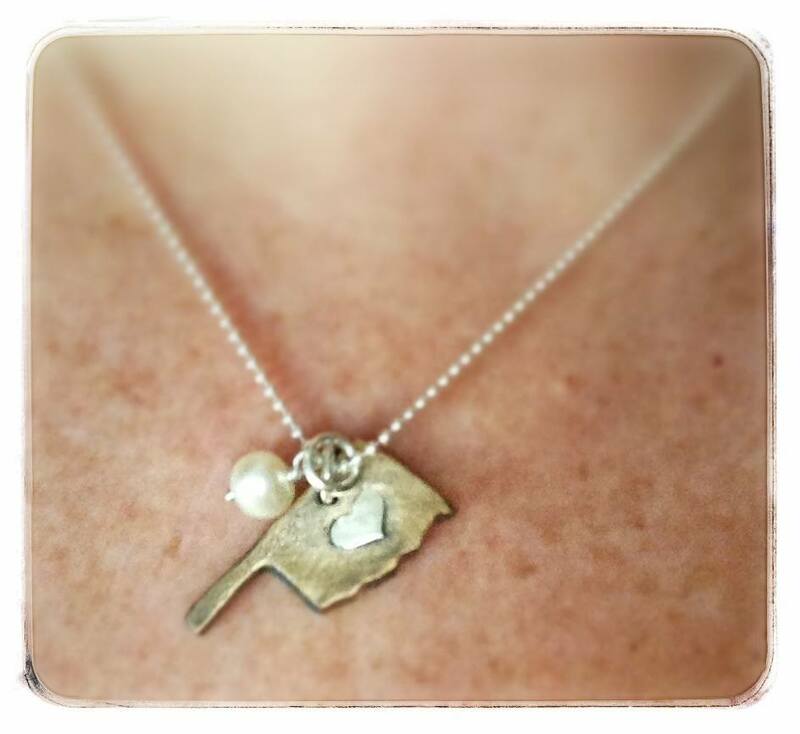 I started thinking about the necklace I was wearing — a pendant of my home state that I purchased recently to support the relief fund for the devastating tornado in Moore, Okla. I’ve worried that my Missouri friends might view it around my neck and consider it a symbol of homesickness or discontent when, in fact, I feel more comfortable and settled than ever. I finally have a dear circle of friends who have heard my stories and I’ve heard many of theirs, which means not every conversation requires a set-up. I am a long ways from knowing everybody — like some who have lived and worked here “forever” — but I’m no longer the kind of lonely foreigner who has to actively seek out social opportunities, or ask for referrals for doctors or plumbers, or ask “Who’s that?” every time someone outside my family and co-workers are mentioned. And I’ve finally learned the short cuts and back roads to many of my favorite destinations, which is a sure sign that I’ve transitioned from outsider to local. So I like to think of my Okie pendant as a talisman, suspended near the heart of an ex-pat who’s successfully transplanted and throwing out roots in all directions of her lovely new garden. Yesterday, I made two dozen quilt blocks. You heard me right . . . 24 blocks. That’s 192 pieces of fabric cut, 168 seams sewn, 672 threads snipped, and too many pins stuck to count. Oh yeah, it’s also two bobbins full of thread depleted. I had a bad case of tunnel vision by the time I finished for the day. Somehow I ended up a few short, so I’m not quite done. I was in the zone so I really didn’t know how many blocks I had made until my back got tired and I quit around 7:00 pm. Once I laid it all out, I realized I was only five blocks away from the finish line. 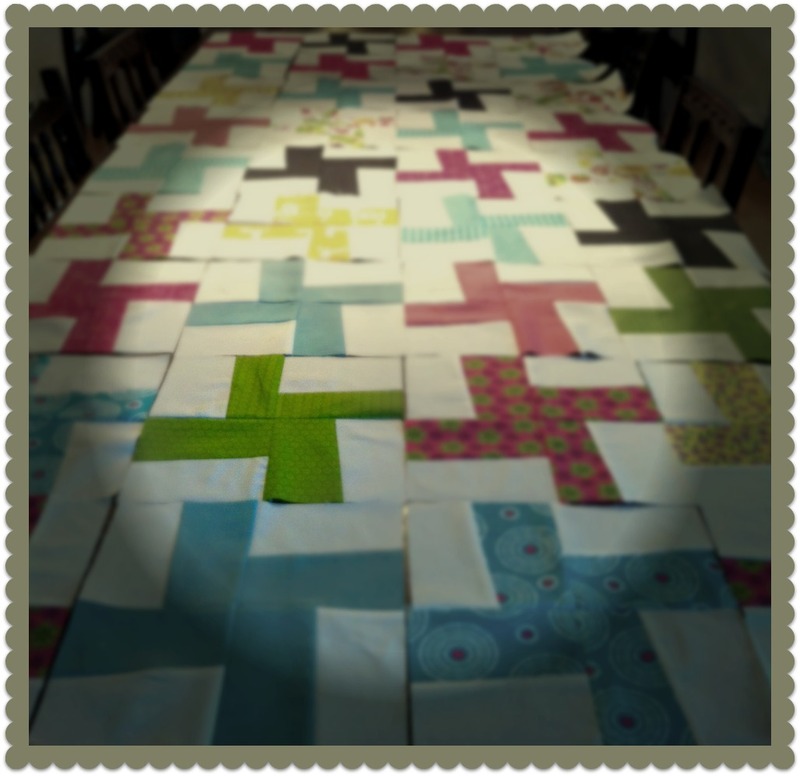 Well, five blocks, a border, and a back — along with quilting and binding. Still, it feels good to be this far along. I’ll be taking a break this week to head to Arizona, but with four more weekends left in May, I have a feeling I’ve got this. I spent my evenings last week putting up the new Christmas tree in the Den and spreading a little holiday cheer around the house. I’ve got more than a dozen large totes of Christmas decorations. Given that I limited myself to a single tree, the mantle, and the buffet, I think I showed considerable restraint. (I also sent a tote with Kate so she could decorate her college apartment even though I know I’ll have to haul it home for the summer). Gone are the days when it looks like the Macy’s Christmas Store exploded in every room of my home. Now all I need to do is buy a handful of additional gifts and get to wrapping. I gave up on the whole holiday card thing years ago. I’m deeply appreciative of those folks who take the time to send them, but in an era of Facebook and Twitter and Instagram and blogging, there’s really not anyone who desires to keep up with us who can’t do so electronically. I don’t know if I’ve succumbed to the forces of modernity or indolence, but I’ve succumbed. And, finally, I made reservations for our family at our favorite restaurant for Christmas Eve. I’ll cook on Christmas Day, but our family has always celebrated both occasions and last year I decided I didn’t really have to prepare two lavish spreads in less than 12 hours. The impulse to do it all has faded, thank goodness. So that’s it. My list is checked twice and the stockings are hung with care. It’s starting to look and feel a lot like Christmas. Not what we say about our blessings but how we use them is the true measure of our thanksgiving. My heart is full this Thanksgiving, brimming with gratitude for our abundant blessings. Our table is full and our bounty is evident. 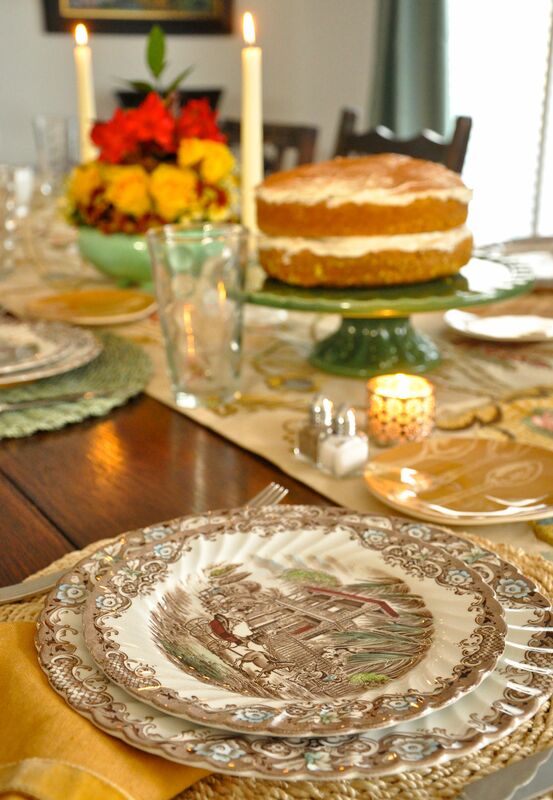 A house full of guests, love for each other, good health, a delicious meal shared in safety and comfort . . . peace . . . these are the jewels of this day I dare not take for granted. May we use these blessings, in measures large and small, that reflect a glad and generous heart. And I wish you, dear friends, abundant blessings. Drop in sometime this holiday weekend, won’t you, and leave me a comment letting me know how you’re spending your Thanksgiving? Power eating . . . football cheering . . . napping . . . traveling over hill and dale to see loved ones . . . whatever your activity, I wish you good cheer and godspeed. I’ll be here on our beautiful Missouri acreage, happily humming ‘round the kitchen, delivering stealth hugs and kisses to any child within arm’s reach, and steeping in the life God has granted me.